Instrumental duo El Ten Eleven is coming to New York’s Le Poisson Rouge tomorrow, Friday, August 5 to give fans another dose of their musical acrobatics. They will be joined by the moody, textural indie rockers The Globes. Widely acclaimed for their live shows, El Ten Eleven is truly a technical marvel to witness or as SF Weekly exclaimed it’s “something like watching two superheroes do their thing.” Eschewing computers and sequencers for a massive array of looping pedals, impeccable precision and jaw-dropping musicianship, the LA-based duo crafts instrumental music that is as cerebral as it is dancey. 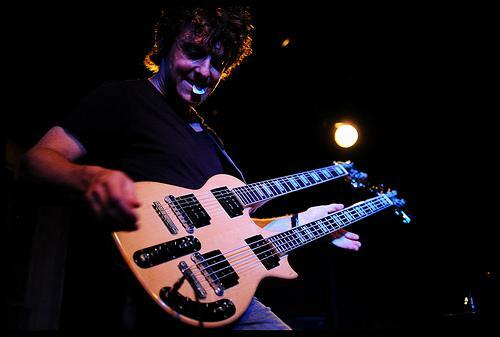 Kristian Dunn rocks a double-neck bass/guitar hybrid (sometimes playing both simultaneously with different hands), adding harmonics, arpeggios, bass lines, while Tim Fogarty pounds his drum kit and electronic pads, all of which are woven seamlessly by Dunn’s impressive maneuvering of more than two dozen pedals. “As each layer upon layer is set, El Ten Eleven’s songs coalesce into head nodding, cog-spinning music machines,” declared LA Weekly.